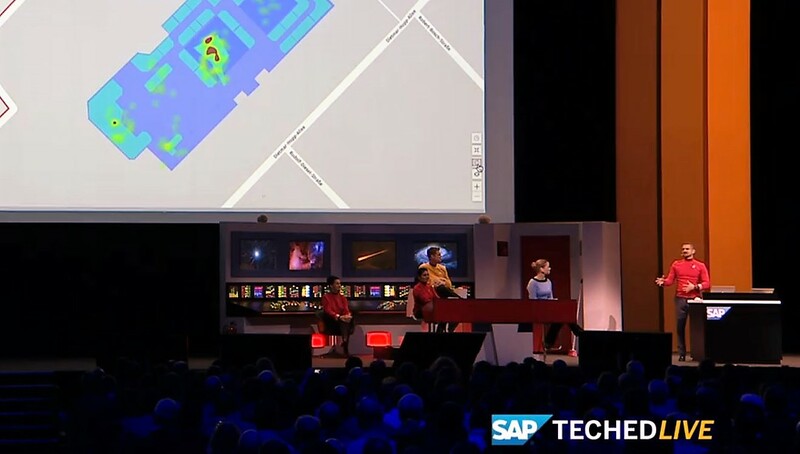 In case you have been living under a rock for the last week, you might have missed Bjoern Goerke’s Star Trek themed keynote at SAP TechEd 2017 in Barcelona. Otherwise, you already know that Bjoern is not only SAP’s CTO but also loves to slip into the role of James T. Kirk, the captain of the USS Enterprise. How does SAP Leonardo IoT Bridge fit into this picture? During Bjoern’s key note, you saw Chekov, the tactical officer of the USS enterprise, taking advantage of SAP Leonardo IoT Bridge to optimize a special promotion for the holiday season by bringing together IoT sensor data (in this case a heat map using infrared sensors to visualize foot traffic of a mall) with revenue information by store. By putting the IoT data into the underlying business context, Chekov could pick the optimal placement for his promotion. So, while it is reassuring to know that Chekov has the perfect tool at hand to “run his business,” remember that the USS Enterprise is on a mission to “explore strange new worlds, to seek out new life and new civilizations, to boldly go where no man has gone before.” Obviously, this requires a certain level of flexibility, to say the least! As the tactical officer on board, wouldn’t it be nice if Chekov could simulate new tactics before implementing them so as to adopt easily to the Enterprise’s ever-changing environment? Well here comes the good news: SAP Leonardo IoT Bridge works seamlessly together with SAP Build, a cloud‑based prototyping tool for designing and building enterprise apps. Without any coding or developer skills, SAP Build allows Chekov to prototype new scenarios, test them with the crew, and – with only a few clicks – push them into SAP Leonardo IoT Bridge for productive usage. Chekov could, for example, quickly pull in data from additional systems, think of new ways for how to visualize the information, and then implement the best approach after validation with the rest of the crew. By the way, I have just been using SAP Build myself this week to create a complete set of prototypes for a proof of concept – all within just a few hours. Besides the fact that I could review my ideas with colleagues in a collaborative way, this will also allow us to showcase our vision to the customer with the look and feel of the final product including mock data for his specific use cases. No coding involved. This is another great example of how SAP Leonardo IoT Bridge helps enterprises run their business operations in a connected world, leveraging the Internet of Things to bring together business operations in a collaborative and persona-centric work environment. “Live long and prosper” and explore the world of Build here for zero federation credits (in other words: it’s free! ).